Democrat Barack Obama is going to defeat Republican Mitt Romney by a comfortable margin in the 2012 presidential election. This forecast comes from a statistical model that uses the primary performance of the candidates and a cycle in presidential elections to predict the presidential vote. In plain English, Obama has history on his side, as well as the fact that he was unchallenged in the primaries. The model, called the Primary Model because of its heavy reliance on primaries, covers elections as far back as 1912, when presidential primaries were first used in large numbers. Since 1952, however, only the New Hampshire primary is included. Overshadowed by the intense Republican battle, Obama won the 2012 primary contest of his party in New Hampshire in commanding fashion. For the record, Obama captured 82 percent of the votes in the Democratic primary of that state, against token opponents. Any time a candidate of the party that controls the White House has gone unchallenged for renomination, the odds are overwhelmingly in favor of that candidate’s victory in the November election. This was evident in 1912, when the incumbent president William Howard Taft first lost the primary battle and then the general election. Primary challenges to Truman (1952), Johnson (1968), Ford (1976), Carter (1980), and Bush (1992) augured poorly for them or their party in the general election. The moment the New Hampshire primary was decided, the model was able to make a forecast for any match-up in November between Democratic and Republican candidates.1 The forecast gives Barack Obama 53.2 percent of the two-party vote over Mitt Romney with 46.8 percent. It is an unconditional forecast subject to no updating or other revision. It assures Obama’s reelection with 88 percent certainty. The moment presidential primaries were introduced, a remarkable precedent was set. In 1912, the Republican Party decided to give its presidential nomination to a loser in its presidential primaries (Taft), whereas the Democrats nominated their primary winner (Wilson), and Wilson went on to victory in the general election. Message to party: nominate your primary winner and you will win the general election—if the other party does not nominate its primary winner. This simple rule packs quite a predictive wallop, but it requires some fine-tuning. Winning or losing primaries may be too crude an indicator to predict the percentage of the vote in the general election. It is also not uncommon for both parties to nominate primary winners. So the vote percentage in primaries provides more leverage. For sitting presidents, who count on being renominated without challenge, the model simply takes into account the vote share received in primaries. For contests without a sitting president, where competition is natural, a measure of relative strength is formed by expressing a nominee’s primary vote relative to the vote received by that candidate’s chief rival (the one with the next most votes, or the leading votegetter if the nominee did not win the primary battle). Short of knowing who the nominee will be, this rule can be applied to any candidate in primary contests, so forecasts can be made for all possible match-ups until the nominations are decided.3 From 1912 through 1948, the results of all primaries were included, but from 1952 onward only the New Hampshire primary is used in the model. In 1952, the adoption of a presidential ballot in the first primary dramatically changed the dynamic of the presidential nominating contest (Adams 1987; Buell 2000; see Figure 1 and Figure 2). In addition to primaries, the forecast model enlists a dynamic of the presidential vote (Jones 2002; Norpoth 1995). Over the course of two centuries, American presidential elections have exhibited a distinct cycle. This is not the pattern associated with long-term partisan realignments that may last 30 years or so. It is a more short-term cycle that has escaped notice. Not as regular as the tides, it behaves more like sunspots and hurricanes. Since 1960, for example, whenever the White House party was in its first term, it has won re-election in five of six cases, with an average share of 55.5 percent of the two-party vote. Compare that to instances in which the White House party went for reelection after two or more terms. Since 1960, it has lost six of seven such elections, averaging a vote share below 50 percent. It appears that the prospect of losing looms large for the presidential party when it has held the White House for two or more terms. But the White House party has little to fear when it has been there just for one term. That may be so because a president who enters the White House by defeating the candidate of the incumbent party—perhaps the sitting president himself—starts out with a pledge of change: from Kennedy’s “New Frontier” in 1960, through Reaganomics in 1980, to Obama’s “Hope and Change” in 2008. The electorate has loudly registered the demand, “It’s time for a change.” But change will take time to be implemented. At such moments in history, one may suspect, the public is willing to show some patience with the efforts of the new administration to work its magic. But when two terms are up, the public may no longer be inclined to give the administration the benefit of the doubt. By then, of course, the two-term limit prevents a sitting president from running for another term, making the odds of retaining the White House even longer for the presidential party. Finally, the forecast model makes an adjustment for a pronounced Republican advantage in presidential elections prior to the New Deal realignment (Norpoth and Rusk 2007). 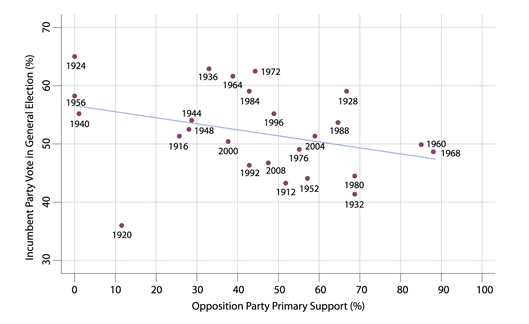 As shown below, the partisan baseline in presidential elections since the 1930s has stayed very close to the point of equal division. The model predicts the Democratic percentage of the major-party vote, regardless of whether that party was in the White House or not. As a result, the primary-support variables had to be inverted for elections with Republicans in control.5 With the primary support of the incumbent-party candidate carrying much greater weight than the one of the opposition-party candidate, whatever happened in 2012 on the Democratic side packs a bigger predictive wallop for the vote in November than what happened in the Republican contest. The estimates for the autoregressive vote parameters translate into an expected length of two and a half terms of party control of the White House. That is good news for a first-term president, like Obama in 2012, seeking reelection. Taken all by itself, the electoral cycle makes Obama the favorite this year, but the predicted vote margin would be too small to offer much comfort. Finally, the adjustment for pre-New Deal partisanship produces a constant estimate that suggests a close balance in presidential elections, notwithstanding the lead that Democrats have enjoyed in party identification for much of the time since the New Deal. where DPRIM and RPRIM represent the primary support of the Democratic (incumbent party) and Republican (opposition party) nominees for president, capped within a 35–65 percent range. It may come as a surprise to some observers that Obama was on the ballot in the New Hampshire primary. He did win in commanding fashion against a field of unknown vanity or write-in candidates. No Democrat of any stature challenged Obama for renomination in New Hampshire or any subsequent primary or caucus. New Hampshire thus provided a clear signal that Obama’s renomination would go uncontested. No sitting president who enjoyed this benefit has lost the general election. Meanwhile, in the hotly contested Republican primary in New Hampshire, Romney won handily.6For the 2012 general election, the Primary Model forecasts 53.2 percent of the two-party popular vote for Obama. This assures Obama’s reelection with 88 percent certainty. In the 2012 presidential election, the twin advantages of history and primary make Obama a strong favorite to defeat Mitt Romney. Hardly any president who came to office in an election that ousted the White House party has lost his bid for reelection. This likelihood practically goes to zero for sitting presidents who faced no challenge in the primaries. Using primary elections has numerous advantages for election forecasting. It enlarges the universe of presidential elections needed for model estimation all the way back to 1912; it features not only the incumbent side, but also opposition candidates; and it provides a real-life test of the candidates’ electoral performance, not proxy variables or trial heats. For over 50 years now, New Hampshire has encapsulated the primary message. As the first primary, New Hampshire thus hands the Primary Model one more advantage—being first to make an unconditional forecast of the presidential election in November. Adams, William C. 1987. “As New Hampshire Goes . . .” In Media and Momentum, eds. Gary Orren and Nelson Polsby. Chatham: Chatham House. Buell, Emmett H. 2000. “The Changing Face of the New Hampshire Primary.” In In Pursuit of the White House 2000, ed. William Mayer. New York: Chatham House. Norpoth, Helmut. 1995. “Is Clinton Doomed? An Early Forecast for 1996.” PS: Political Science & Politics 28:201–207. Norpoth, Helmut. 2000. “Of Time and Candidates: A Forecast for 1996.” In Before the Vote: Forecasting American National Elections, eds. James E. Campbell and James C. Garand. Thousands Oaks: Sage Publications, 57–81. Norpoth, Helmut. 2001. “Primary Colors: A Mixed Blessing for Al Gore.” PS: Political Science & Politics 34: 45–48. Norpoth, Helmut. 2002. “On a Short Leash: Term Limits and Economic Voting.” In The Context of Economic Voting, eds. Han Dorussen and Michael Taylor. London: Routledge, 121–136. Norpoth, Helmut. 2004. “From Primary to General Election: A Forecast of the Presidential Vote.” PS: Political Science & Politics 37: 737–740. Pomper, Gerald. 2001. The Election of 2000. New York: Chatham House Publishers. Yule, George U. 1971. “On a Method of Investigating Periodicities in Disturbed Series with Special Refer- ence to Wolfer’s Sunspot Numbers.” In Statistical Papers of George Udny Yule, eds. A. Stuart and M. Kendall. New York: Hafner Press, 389–420. First posted January 12, 2012, at http://www.huffingtonpost.com/helmut-norpoth/new-hampshire-primary- for_b_1200199.html. For the 1912 election, the two-party vote was approximated through a regression of the congressional vote on the presidential vote. The intrusion of Teddy Roosevelt’s third-party campaign was so severe that the Republican candidate ended up in third place with only 23.2 percent of the total popular vote while Wilson, the Democrat, won with 41.8 percent. Using a regression of the House vote on the presidential vote in the 10 elections preceding and following the 1912 case (1872–1952), I derived an estimate of the two-party Republican vote in the 1912 presidential election (56.3 percent) that was used in this analysis. Note that the correlation between the two-party vote for president and House in that period was extremely high (.95). The two-candidate measure of primary support was truncated within a range from 35 to 65 percent. 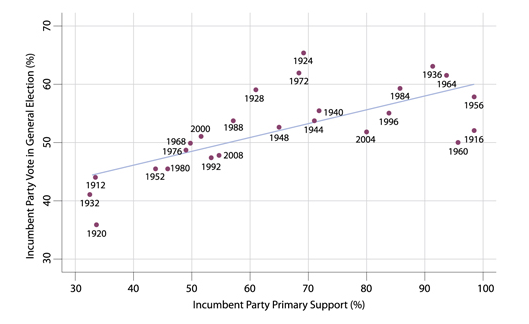 The relationship between primary support and the general election vote is linear only within the restricted range of primary support. This is based on the cyclical equation: VOTE (t) = 49.2 + .52 VOTE(t-1) – .47 VOTE (t-2), where VOTE refers to the Democratic percent of the two-party vote in 46 elections from 1828 to 2008. The cyclical forecast was posted on September 22, 2011, at http://www.huffingtonpost.com/helmut-norpoth/comfort-for-obama- history_b_976246.html. The inversion was done around the mean of 56.7 percent for incumbent-party candidates and 47.7 percent for opposition-party candidates. Obama got 82 percent of the votes cast in the 2012 Democratic primary in New Hampshire, putting him safely over the 65 percent cap. Romney won the Republican primary in New Hampshire with 97,532 votes to 56,848 votes for second-place finisher Ron Paul, giving Romney a relative share of 63.2 percent among the top two finishers. http://www.cnn.com/election/2012/primaries/state/nh, January 12, 2012. Helmut Norpoth is a Professor of Political Science at State University of New York, Stony Brook. He has previously taught at the University of Texas, the University of Arizona, and the University of Cologne in Germany. He has also taught at the European Consortium for Political Research where he lectured on quantitative methods. He regularly assists The New York Times with its election night analysis and has served as a polling analyst for the Foreign Policy Association. Dr. Norpoth’s expertise covers wartime elections, historical changes in partisanship (realignments), and forecasting elections. He has co-authored or co-edited several volumes on elections in the United States, Germany, and the United Kingdom. Apart from books, his writing has appeared in the leading professional journals. Dr. Norpoth received both his M.A. and Ph.D. from the University of Michigan.